First a few updates. I’ve been silent for a little while working feverishly on a few things. I’ve revised Mistress of the Dancing Bones and I’ve completed the rough draft of its sequel, Mistress of the Midnight Sky. In the meantime, Dancing Bones has picked up a few pleasant reviews here and there, and I’d like to share them with you. First up, blogger, educator and fellow Human Wave enthusiast Stephanie A Souders reviewed the book as part of her series on Human Wave authors. She’s tough but fair, a sort of sci fi fantasy Simon Cowell, so I was quite nervous to read it. All in all I think it’s a very positive review. Alexander’s premise is uncomfortable — but in a good way. Essentially, several centuries before the start of Mistress, the human race entered into a compact with vampires who dub themselves the nephilim: military defense against the monstrous creatures who walk the Deathlands in exchange for mortal blood. As revealed in Mistress, the society that grew from this compact is quite exploitative if seen from mortal eyes. Leaving aside the worst of the nephilim aristocracy – who treat the humans in their midst as either sexual playthings or cattle – even the main character’s father must accept human sacrifices to feed his hungry forces. It’s a cruel universe — but also a fascinating one worth exploring. Read the full review here. Next, fantasy author Sheri J Kennedy gave a very gracious and generous review. From the instant I began reading, Ashia, our heroine was captivating and her situation compelling. Her intensity and that of her world grew throughout the story keeping me engaged. I was rooted to the page withstanding disgust, terror and horror to see her stand strong. Alexander is masterful in the integration of the intricately built fantasy world with this powerful coming of age story. Magic is in her blood and the politics of her world are her inheritance—she must come to terms with them to know herself, and she embraces them fully in an unexpected and oddly triumphant way. At first I wished the novel carried more inner dialogue so I could know the character’s better. But when I was done reading, I found I missed them and had come to know them well, especially the unquenchable Ashia. I’m so glad the next in the series will be coming soon! Thank you Sheri and Stephanie for your reviews! 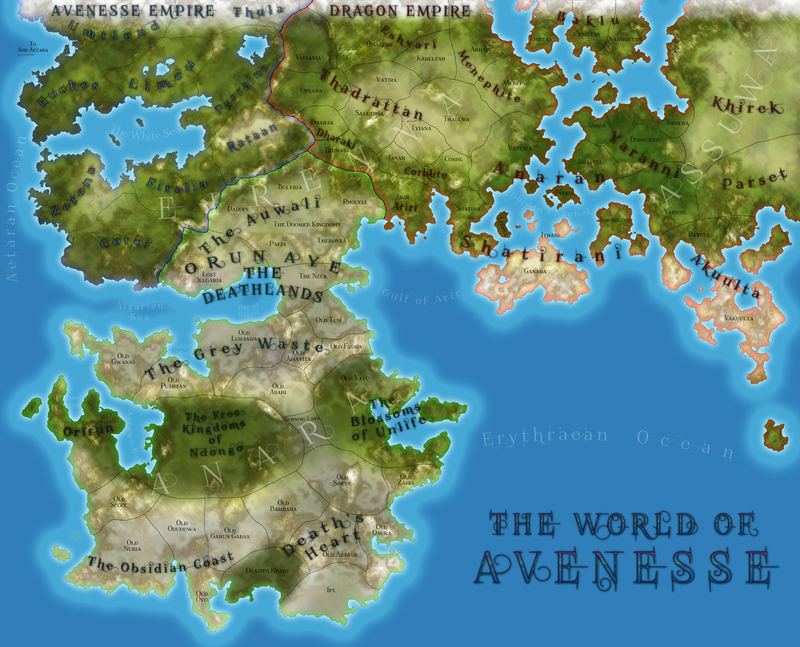 I’ve finally made a large scale map of the vast majority of the world of Avenesse. This covers the three grand empires from the novels: over the Avenesse Empire, the Dragon Empire and Orun Aye: the Deathlands. These empires in turn cover the majority of three continents: Eirenna in the north, Anara in the south, and Assuwa in the far east. 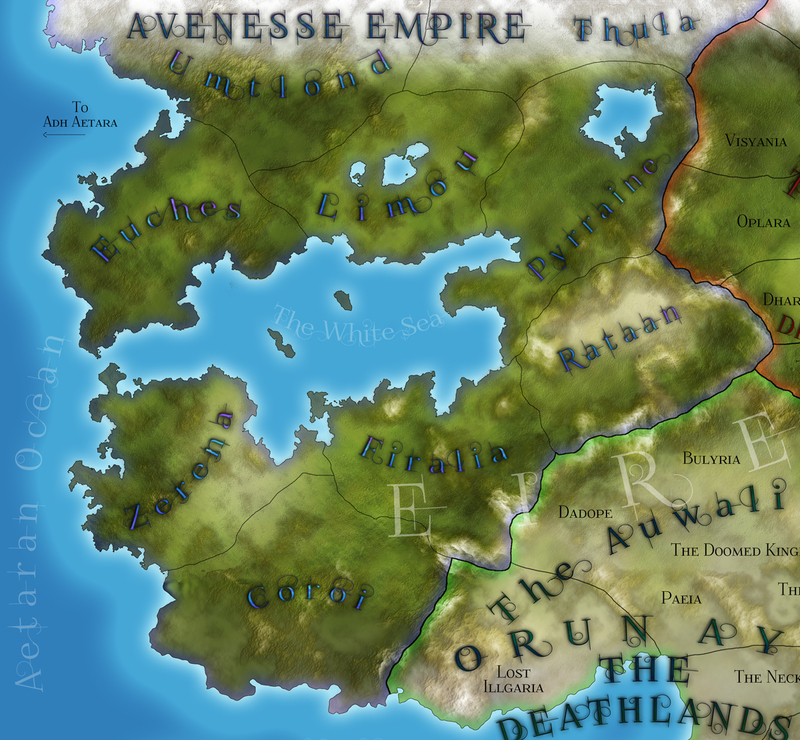 Here is a blowup of a little more of the Avenesse Empire minus the arctic regions of Umtlond and Thula, the mysterious unnamed province in the map in the book. It covers most of western Eirenna and surrounds the White Sea. 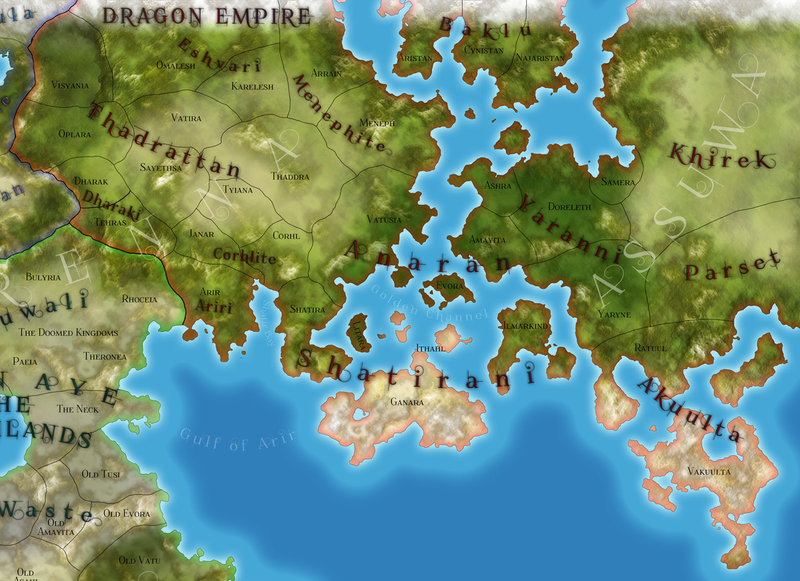 The Dragon Empire, which dominates large parts of the continents of Eirenna and Assuwa, separated by the Golden Channel, a very shallow sea. Khirek and Parset continue far beyond this map in near endless grasslands and deserts until they collide with the distant eastern lands of Kyoushou. Which probably won’t come up in the novels. Probably. And last but certainly not least, the mysterious Deathlands. The locals don’t call it that of course, they call it Orun Aye, a blasphemous name that in the Yoruba language means something approaching Heaven on Earth. 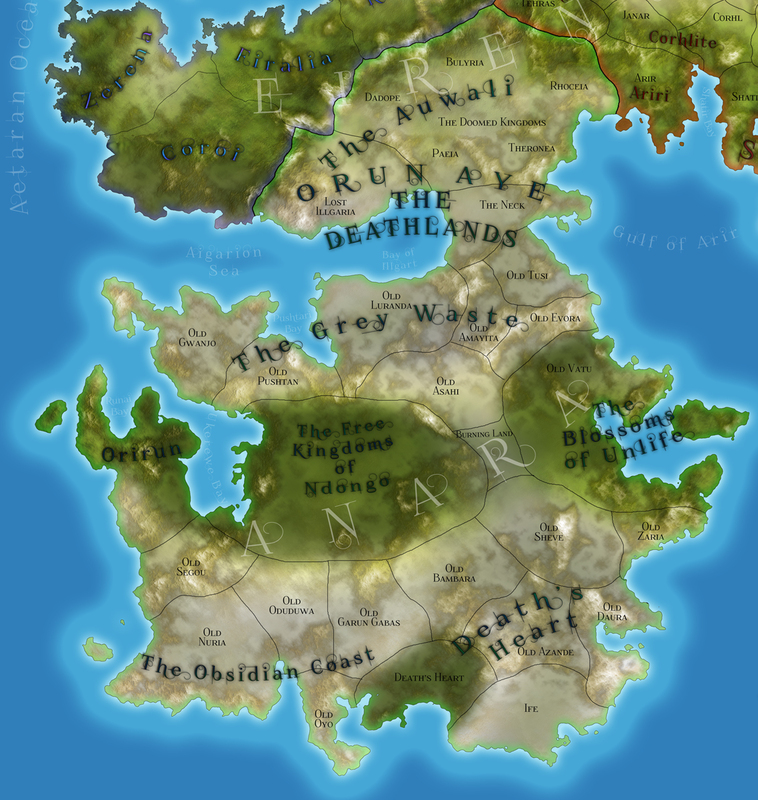 The Deathlands covers most of the continent of Anara and has pushed into southern Eirenna in the region called the Auwali, which is Swahili for ‘border’ or ‘boundary’. The Avensh call this region ‘the Doomed Kingdoms’ as they were conquered and slaughtered by the armies of the Deathlords so quickly. Back when living mortals lived here, it was referred to as the Illgarian subcontinent. It pushed into the Eirenna continent and formed the massive Dragonspine mountains (roughly equivalent to the Himalayas), which for now serves as a natural barrier to the advance of the armies of Unlife. I’m not entirely sure how much I’ll reveal of the inner workings of Orun Aye in this series of books. Reviews for Mistress of the Dancing Bones are starting to come in and people have been very generous with their praise. Here are some of the highlights. Mistress of the Dancing Bones Now Available! Mistress of the Dancing Bones is now available on amazon both in a print edition and as an ebook exclusively through Kindle! You can also order it through most bookstores such as Barnes and Noble. The list price is $12.00 for print and $3.99 for ebook. I’ve set up a Pinterest board for featuring images and inspiration related to the many cultures and characters of the novel, “Mistress of the Dancing Bones”. Notes and behind the scenes information are provided where relevant, and you can get a lot of behind the scenes looks and deeper character backgrounds here. Enjoy.